At the end of last year, Matt announced to me that he was ready to start the addition. I kind of freaked out, dug my heels in, and made it clear to him that I wasn’t ready. The was no electricity, no insulation, and no drywall. And the HVAC ducts weren’t connected. So with this daunting project ahead of me and at the top of the priority list, the idea of starting an addition just seemed like way too much for me. But now that the studio is much further along and actually feels like a room, I can begin to see the light at the end of the tunnel with this area of the house. So now I’m ready to dip my toe into the plans for the addition. So we’re going to move forward very slowly and at a casual pace. For now, the only thing addition-related on my plate is to finalize my basic floor plan ideas so that I can meet with the contractor in the next couple of weeks and we can start putting together a plan, a rough estimate of the cost, etc. It’s been a while since I’ve shared anything about our plans, so while I will be sharing more of the details as I figure those out, I thought I’d share the basic floor plan changes that will occur. And at this point, I’m definitely open to any suggestions. Before an addition can be built, the first order of business will be to remove the current master bathroom and sunroom. And I haven’t done a single thing to make any improvements to it since we’ve been here. But you can see that even with new finishes and fixtures, that’s still not a practical bathroom for someone who uses a wheelchair. Right now, we make do with what we have, but I’d love for Matt to have a big bathroom with a spacious accessible shower and all of the other things that can make his life easier from day to day. So there’s no question that the current bathroom must go. There’s nothing there to salvage. In that picture above, the doors to the music room are on the left, and the back wall of the house is on the right. 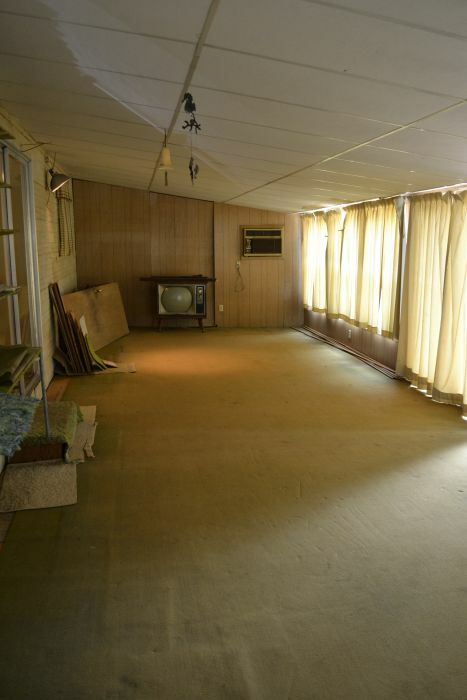 This room isn’t salvageable for several reasons. You can see that it was added on in the same way that the storage room at the back of the studio (which is now the half bath, back entry, and storage closet) was added, which is also how the pantry area was added — they just attached the roof to the existing roof, and continued to slope it away from the house. That wall on the back of the sunroom is just high enough for the height of the sliding glass door, so it’s not even seven feet high. Also, there’s a significant step down from the music room into the sunroom, which isn’t practical at all for Matt. And I’m pretty sure that the current floor in the sunroom is loose carpet lying on top of particle board, which is lying on top of a combination of gravel in some areas, and concrete in others. 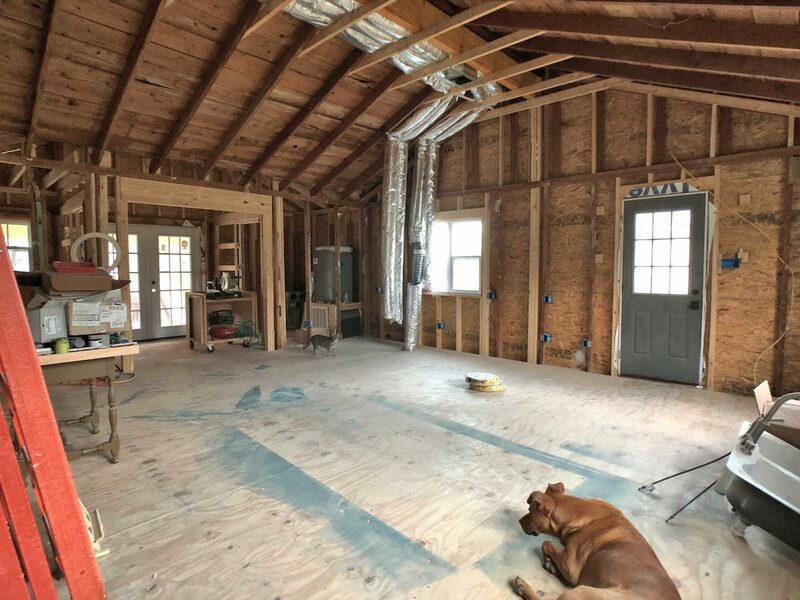 Naturally, we want the floor built up to be level with the music room and the rest of the house, and we want a plywood subfloor instead of particle board on top of gravel and concrete. And then I want the roof built so that it ties into the existing roof just like the carport does. That will eliminate that need for continued sloping towards the back wall that results in the sloped ceiling that’s not even seven feet along the back wall. So both the current master bathroom and the sunroom will be torn down completely, and we’ll just start over. And what will those look like? Let me show you the plan. The current master bedroom will become the master bathroom. 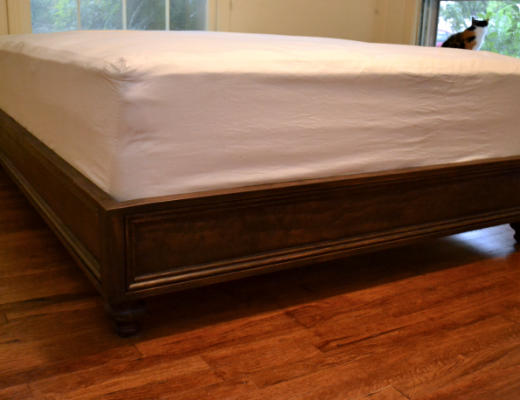 We will add on a new master bedroom, which needs to be a minimum of 22 feet long. So to fit the current space available for the width, the room will be 14.4 feet by 22 feet. The current closet in the master bedroom (which is between the bedroom and the hallway bathroom) will be opened up to create a hallway that wraps around the hallway bathroom. We’ll add a laundry room, and on the advice of many readers, I added a doorway from the bedroom to the laundry room, which will be a pocket door. My requirements in that room, at a minimum, are washer, dryer, utility sink, hot water heater, and dog wash area. We’ll add on a family room behind the music room and kitchen, and I will have an actual, real, working fireplace in there. I think our room is wider than the one shown, so our closets would be wider as well. And then from the back French doors in the bedroom and the family room, we’ll have a large deck that stretches across the back of the house so that Matt can easily get outside from either area. So that’s the plan as it stands right now. Of course, everything is subject to change, but I can’t see it veering much off of this path. From here, I need to start thinking about a few details that will have an impact on the bottom line cost. For some things, like electrical, those costs can be estimated without me having to know exactly where I want all of my switches and outlets. But for other details — like a dog wash area in the laundry room — those need to be specified up front so that I’m not surprised by a big cost add on later. And the bathroom, especially when designing for accessibility, can have all kind of surprise expenses. So I need to start thinking through those details and getting them down on paper. I’m hoping to schedule a meeting with the contractor in the next couple of weeks, so there’s no room for procrastination on this one! I am curious about how your guests will typically enter your home. Let’s say your mom and brother come over for a cook-out. Will they park near the carport and enter from the back of your studio, or once the deck is built will they come through the family room entrance? The reason I ask, is I wonder if guests will use the same door to enter the home as they will to go out on the deck. If you are hosting a cook-out, can you easily get to and from the deck from the kitchen. We entertain often and living in Iowa, it seems like 6 months of the year we have mud or snow to contend with and going in and out of the kitchen to the yard is a pain. I am curious about your guests have a clear path to wherever you will entertain them as well as a restroom and not track through your whole house and that you can easily transport beverages and food to the deck (if that’s the way you intend to use the space). I think Kristi already addressed that they aren’t really a huge entertaining family. I think she talked about this back when she was originally making the living room a dining room and then changed her mind. The idea to have a door between the master bedroom and laundry room is a great idea in general, BUT, in your proposed floorpan, the bedroom doorway and laundry room doorway in the hall are so close to each other that it does not seem important. 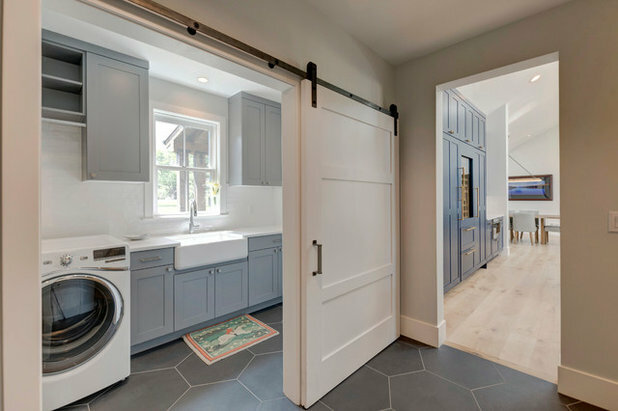 I think eliminating the pocket door between master and laundry room will give you better wall space in both rooms and allow for better cabinet space, etc in the laundry room. I agree and honestly laundry rooms can be loud and noisy and I wouldn’t want a door to one in my bedroom. Currently our laundry room is literally right outside our bedroom and even with the door closed I can hear our washer and dryer running and ringing when they are done. It’s pretty common to do a load of laundry right before bed for most people and I wouldn’t want to hear the machines running through a door. It’s so close I don’t think you’re really saving any trouble or time walking through the main laundry door to the bedroom door. Who really folds clothes in the laundry room anyway? Most people I know, including myself, take it to the couch to fold! I really have to agree the the door between the master and laundry being left out for all the reasons listed above. It’s worth considering Kristi. That laundry room looks to be the size of their current master. I think they will be fine with cabinets/storage in such a huge room plus all the storage in the kitchen, the studio, the pantry, the linen closet, and the bedroom closets. I can’t imagine what two people would need to store in a laundry room with all that other storage in the house. I do agree, however, that it limits where the bed will go in the master, but most people aren’t in their bedrooms all that much anyway. She might be accommodating for Matt’s wheelchair so he can get in the room as well. I was thinking the same thing. Why give up valuable wall space in both the bedroom and laundry room, when they are right next to each other? I agree with not adding a door, but id for sure consider a laundry chute type device to be able to put my dirty clothes straight into the laundry room! I wonder if a laundry chute between the two rooms would serve the same purpose. I guess I don’t understand how they could have a laundry chute when all of the house is one floor? We had a laundry chute a few houses ago, but it went from our bathroom (main floor) into the laundry room (in our basement). I would LOVE to have the laundry room near the bedrooms. The only time I’m in our bedroom is to sleep and I never run laundry at night; so any noise wouldn’t bother me. I’m also guessing that since Kristy works out of the house, she probably does laundry when they’re both awake. She’ll probably be on the other side of the house in her studio and Matt will probably be in his game room; so any noise wouldn’t bother them. Home Town just did something like that in one of their episodes. The master bathroom and laundry room are back to back, so they had a cabinet in the bathroom that opened into a nook in the laundry room for the hamper. More like a pass through than a laundry chute. I’m just going to throw this out there. You have a dog, and a dog washing area, you really need to have an outside door, to bring a muddy dog in directly to the washing area, instead of the window. I’d do that instead of the BR pocket door, which is not a bad idea, but you asked, so there you have it. I like practical, and with a dog, that is your most practical idea, IMHO. Your plans are great and I know you’ll weigh each option, and find just what will work for you! I agree with Cheryl and Justin that a door into the laundry room from the outside would be advantageous for bringing a dirty dog through the house for a bath. I love all the room you have given yourself for Matt and you in the bedroom and the bathroom. I’m so happyfor you both and excited for this big step! This is exactly what I was thinking, too. In theory, it’s a good idea, but if you decide to finish washing or drying a load of clothes at bedtime, you would hear it running even with the door closed, unless there’s some magical noiseless washers and dryers I don’t know about. I would rather have the wall space in both rooms, especially since the bedroom door and laundry door are right next to each other in the hallway. Just my opinion. Very exciting! So, kind of a nosy question, but why does your bedroom need to be 22′? 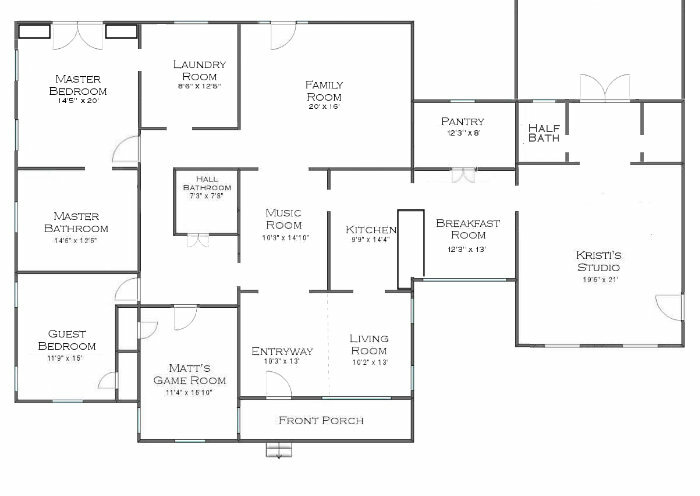 And does the master bath need to be the same size as the current master bedroom? One thing I noted is that it looks like you’re going to be extending your house back by more than what it currently is. Given that none of the existing foundation will be kept, what I’m about to suggest might not matter much, since you’ll be pouring all new foundational structures. But, if you could make your master bath smaller, you might be able to bump the wall between the master bed and bath in a bit and not have to extend the house out so far back (if you don’t need the space in the laundry or family room). Anyway, just a thought. I love the idea of a deck all along the back of the house. That would be great! Do any of these plans mess with the trees that are back there? Are you still inspired by the navy and coral for your master bedroom decor? I’m betting it has to do with the space and clearance needed for Matt’s wheelchair and the furniture they will have in the room. The bathroom will also need to be larger since it’s going to be planned to make it accessible for Matt. I may be way off base, but I was guessing it was so she could get the appropriate width hallway and a laundry room of adequate size to accommodate a dog washing station, washer, and dryer, and have that back wall line up all as one. Yes, she wants to have a large shower area for Matt to maneuver his wheelchair into, and also needs room for him to use sinks, etc. Bedroom – I assume the size has to do with the existing roof lines and new hallway. Kristi, I’m excited for you and Matt, and to follow along. I’ve read all the suggestions so far and I’ve nothing to add. I do want to keep the master bathroom the size of the current master bedroom. I know it’s big, but wheelchairs just take a lot of room to maneuver, and I’d love for Matt to have a really big, open room where he doesn’t have to worry about bumping into things. I arrived at 22′ for the bedroom by taking the amount of space currently between Matt’s side of the bed and the wall (5′ 3″) and adding a foot to that, because I need more room to maneuver the hydraulic patient lift that I use to get him from bed to his wheelchair. Then I doubled that (because of my need for symmetry, because if he has 6′ 3″, on his side, then I’ll need that on my side too). Then I added the width of a king size bed, plus two feet for the depth of the closet flanking the French doors, and arrived at just over 21 feet, so I rounded up to 22. I’m not sure about the colors yet. I’ll probably look through my stash of fabrics, see which ones I’ve purchased but haven’t used yet, and go with one of those as a jumping off point for the bedroom. The only tree that’s will still be in jeopardy is the big oak tree by the carport. It’s still hanging in there and looking healthy, but the moment that changes, it will have to come down. All of the other trees are far back enough on the property that they won’t be in the way of the addition. Kristi, I’ve been following you since the condo and you just keep getting more and more interesting to me, if that’s even possible. I’ll be so into your accessible shower journey and really any and all universal design concepts you employ. Besides, I think curbless showers look amazing! And you have really given me food for thought when it comes to giving square footage to a walk in closet. I can really see my husband and me choosing attractive reach in cabinets instead. We have had walk ins in our last 3 homes and for us they allow us to accumulate too many possessions. And – hello! – a dog wash! Weird as it may be that’s a dream item for us. Give Cooper a kiss for me! I agree about the dog wash! I would LOVE to have one in our house. I’m looking forward to see how Kristi executes this. Re: the Universal Design Livi g Labratory. Looks like a great project! The only thing I noticed is that there aren’t any windows in the family room, other than the door. I’m sure you have a layout in mind for the space but if you can add some windows it would really open up the space and be a beautiful cheery space. Just a thought from someone who craves sunlight and sleeps with the shades up! Ha! I didn’t notice that! 😀 There will definitely be windows. I’m not sure how everything will be configured right now, but I can’t have a family room without windows. Love your plan and I would keep the door from master into the laundry. Our laundry IS IN our master walk-in closet and I love it! It has been this way for 20 years and no regrets. We do not have children at home so it is just the two of us creating dirty clothes. I do not have to tote clothes anywhere…. right from the dryer to a hanger. My ironing board is also there and always set up. Easy. I would question the rear entrance door and its placement. Also do not see any windows and maybe you just haven’t gotten there yet, but lots of windows/glass/ natural light would be super. Matt will need to roll from carport into the house easily and I guess that will be through your studio as he would be always covered in case of rain. You could sure have a cute little courtyard between carport and family room with an entry there. Just some thoughts. Whatever YOU do will be super as you have such good taste! For me, I would need bigger closet in Master bedroom. Matt could have his own easier access one. I like the dog wash idea, but I wonder how useful it might be in a situation where he goes out, gets filthy, and then needs a bath. You’re going to have to drag him THROUGH the house to get to the laundry room. Seems to me the dog wash would make more sense in the bath off the carport. Unless that’s part of the reason for the sliding door from the bedroom. I suppose then, you only have to drag him through the bedroom from the back deck. I’m glad you’re going ahead with the addition. It will be so great for Matt. He’ll have room to move about & go outside. Just think of when it’s all done you & him will have time to enjoy it all. I remember you saying your goal is for him to be able to go all around the outside of the house. I would miss going outside so I’m excited for him. Nice for him to have the accessible bathroom too. Shower big enough to roll in & lower sink to roll under will be wonderful. I know you help him a lot but since you said this is your forever home it will also be great on your back as you get older. I’ve been following you since you rearranged your kitchen cabinets as a temporary thing. Will be watching this stage. Good point. I think I would need to put a door in the laundry room instead of a window. Given that you live in Texas, where the temperature is warmer most of the year, I almost wonder if you should consider an outside dog washing station. It’d be cheaper to do and you wouldn’t even have to drag him into the house all dirty. Outdoor showers are great for humans, too. You often see them on the backs of beach-side homes for rinsing off salt and sand. But they’re great even after a day of messy gardening or work in the workshop. Here’s a thought. We have our separate closets in our bathroom. They have drawers and room for hanging clothes. It is nice to get out of the shower and have all your clothes right there. Might not work with your space, but it keeps clothes from piling up in the bedroom. Just an idea. It looks great but I agree with the others that I would not want a door from my bedroom into the laundry. What I would want is a door from my deck to that big laundry room because I’d have my dog washing station double as a small shower so I could wash myself off after gardening and dump the dirty clothes in the laundry and not have to walk a dirty dog through the house to get to it. In a perfect world I’d have this. More glass in the family room. With a big, private back yard, it would be great to have an open view. I don’t agree with those that think you master bath is too large. My mother is in a wheelchair and it would be a luxury for her to really be able to get around easily in the bathroom, have a big shower level with the floor, a nice roll up sink with turning space, and have more space for grab bars. Sorry, I meant to add that I would make the window in the video’s mudroom open like a door because I do think that 3 doors so close together on the deck is one too many. 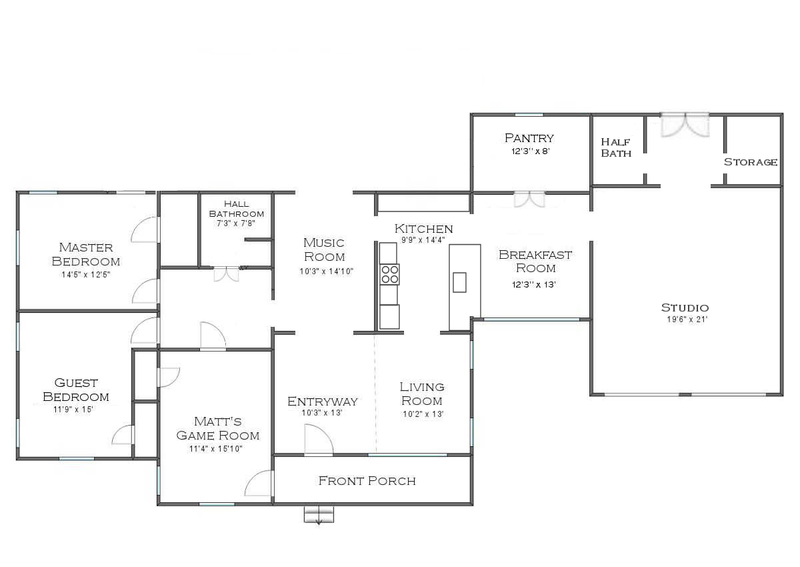 I like that you can walk straight through the house from one door to the next so I wouldn’t want to move that door but I would like to see the family room door a double French door to match the bedroom with the left panel lining up with the front door. I’m not sure if you’ve seen this, but look up Rosemarie Rossetti and her Universal Design Living Labratory. They built their house with everyday life in mind for someone in a wheelchair. You might see something you haven’t thought of. Looks fantastic and I look forward to the journey and adventure this project will be. The one comment I echo is you may want to consider more windows in the family room. I’m so glad y’all are moving forward on this. I know you previously mentioned an “emergency exit” for Matt. I think the French doors are for that. My question is; “ is there going to be a concrete path of sorts for Matt should he, Heaven forbid, need it? Would/could he maneuver it by himself? 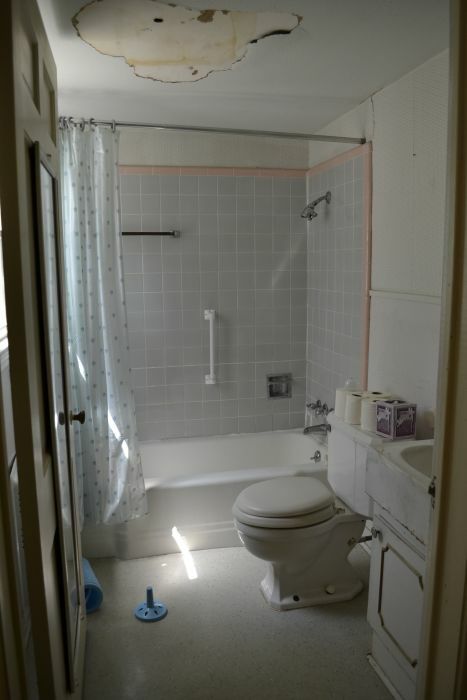 I am going to guess that the contractor will say that you would save money by situating the laundry room and master bathroom adjacent to each other, for less plumbing work. It would probably be even better if you could set them adjacent to the hall bathroom, but I see why that wrap-around hallway is so appealing! I like your ideas! Linen closet for the bathroom. And for when you get down to nuts and bolts design work, I would include a closet pole in the laundry for immediate dryer to hanging up for fewer wrinkles, a place for hangers near the dryer, and one of those wall mounted extendable dryer racks for the stuff that can’t go into the dryer. I regard “folding counters” as a place to pile all the things, but a place to hang up clothing immediately is priceless. My suggestions/thoughts are a drying space above the utility sink or dog wash, so you can hang dry clothes. Getting a roll-in shower can be tricky but make sure the contractor takes a look under to see what the existing structure is to modify. You might be required to have some funny/extra venting in the laundry with the extra utility to the laundry room. I’ve had a friend (has severe asthma) eye a steam fireplace vs real fireplace and they’ve almost convinced me on getting one (still too pricey for me). These heat up a space well, have the extra safety with less venting requirements. They want one, because they are in a multistory townhouse and the space to vent is occupying a valuable chunk of floor above. I’m not as symmetrically minded with this next thought so this is a personal for me idea… build the closet structures on the shared laundry wall or use some of the laundry for a wide narrow closet instead of a pocket door/built in wardrobes, then it can become a pass-thu closet and place to hide a hamper. Your heart is more set for the wardrobes so go for them, it’s your space! You’ve got great plans for your space! The only thing I would suggest, as others have, is rethinking access to the laundry/dog wash area. 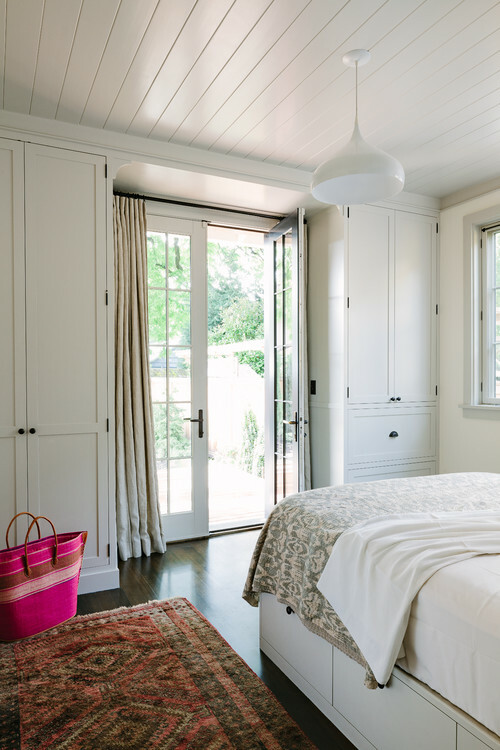 Since it’s so close to the master bedroom already, and you could make that entrance a pocket door, I’d definitely consider a second door nearer to the outside door rather than from the bedroom. As mentioned, it would make it easier to get Cooper to the dog wash if he’s coming in really dirty, and also for yourself to slip into the laundry area for a quick shower if you decided to add one in there. Although, you do have easy access to your own shower in the bedroom. Changing the door could also give you a long wall in the laundry for cupboards, counters, perhaps more efficient work space. Just a thought. Obviously, the key is that you know your own home and how the two of you live, so your final choices will be influenced by those things more than what someone else thinks would work for them. Best of luck as you meet this dream and make it happen! 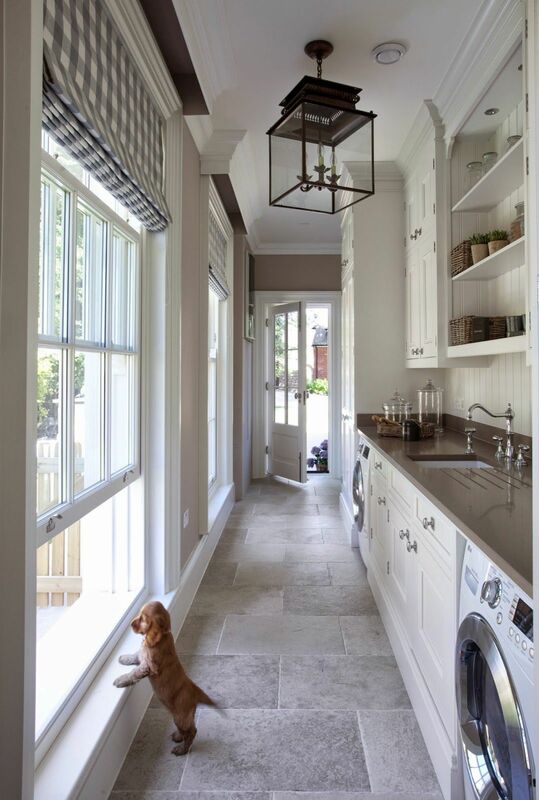 I love everything, the closet idea, the dog washing station. Love someone else’s idea about the door to get a muddy dog inside. Not sure laundry chute is needed since laundry room is adjacent to MB. Things I couldn’t live without in my laundry room is a rack (I use a vintage wooden ladder) above my washer and dryer) that I can use to hang items on hangers to dry, or that come out the dryer. I would LOVE a folding counter, but I have no room, but if you have room, I would consider one. My last question is are you goingvto do something awesome with that vintage TV I saw in the sunroom. There are so many cutr ideas for how to repurpose these. I saw one repurposed into a cat bed. Ha! I was wondering if someone was going to mention that TV. 😀 That picture was actually taken before the previous owners got everything out of the house. That was theirs. I don’t know what they did with it, though. Where is your laundry now? I don’t see it on your current plans. My washer and dryer are in the sunroom on the wall shared with the hallway bathroom. I would suggest a thermostatic valve for the master bath. With a disabled person in our household it has been an invaluable safety feature and so convenient. Quality plumbing fixtures can be very expensive so I did a lot of research on plumbing forums and California Faucets was recommended pretty much across the board. 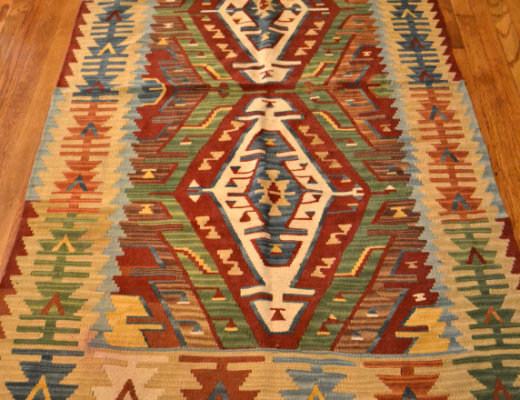 The quality is superb, the prices are reasonable, and the number of styles and finishes is mind boggling. I have a couple of questions…. how wide is the hallway going to be beside the hallway bathroom and how wide are your doorways into the bedroom and Matts game room. Speaking from experience, standard hallway widths are too narrow for someone in a wheelchair. And it looks like Matt is going to turn to get into the bedroom and regular door sizes are way too narrow. We had to enlarge the doorways to 36 or 38 inch openings. As for the hallways we couldn’t do anything about it and had to put up with scrapes on the walls and baseboards. As for the bathroom have an opened shower area instead of a closed in one. Easier for Matt to just roll in. That part of the bathroom could be like a wet room. Whatever you do it will be awesome. The hallway between the bathrooms will be 42 inches wide, unless we move the wall for the master bathroom to make it wider. My mom’s hallway is 43.5 inches, and it seems plenty wide. But the hallway between the hallway bathroom and the laundry room will be wider. I’m not sure how wide right now, but we can make it as wide as needed for Matt to maneuver that corner easily. I had even considered setting the bedroom doorway at an angle, but so far, I haven’t figured out a way to do that. Our current bedroom doors are 32 inches. I told Matt that I would widen them to 36 inches, but he didn’t want me to. He said 32 inches is wide enough. For the shower, I’m really hoping to have a long shower on the entire window wall, with a door-less entrance on either end. But I’m still developing on that plan. I think 36” is a good idea. You don’t know what the future holds – Matt could need/want a motorized chair sometime. Those seem much bulkier than a regular chair. I’m a project manager for a door/frame/hardware company. 34″ clearance is ADA, so we always go with 36″, because by the time the (1-3/8″ to 1-3/4″) door swings open, you lose some space. My vote is to go with 36″ doors. I sincerely support the idea of having a door from the outside into the laundry area if that is where Cooper is going to get washed! And I would not recommend a door btween master bedroom and laundry – not only because of the noise, but because of humidity! I love the idea of the big bathroom and guess that it’s not only luxurious but completely neccessary for Matt. Oh, and I’m with the “more windows in the family room” faction, as it now looks like loads of walls and too little light to me. But I’m sure that you know what you ‘re doing (perhaps a cinema room???) and am looking forward, as ever, to seeing you transform this area! There will definitely be windows in the family room, but right now, I’m just not sure where I want them. There aren’t really many options since there’s only one full exterior wall, with part of the side wall being exterior. But I want as many windows as I can have, considering that a fireplace also has to occupy that back exterior wall. I love this idea also! So many good comments, observations! I think a French doors in the laundry would be so nice. And two or three double French’s doors in the family room would bring in so much light. I think you can never have enough daylight. 😄 think how awesome all those French doors would look from the backyard! And maybe with a pergola along that span! You know you will end up opening the wall between kitchen and family😉 so wouldn’t be so nice to look out into the backyard from the kitchen? The first house I ever bought was designed and built by someone who used a wheelchair. 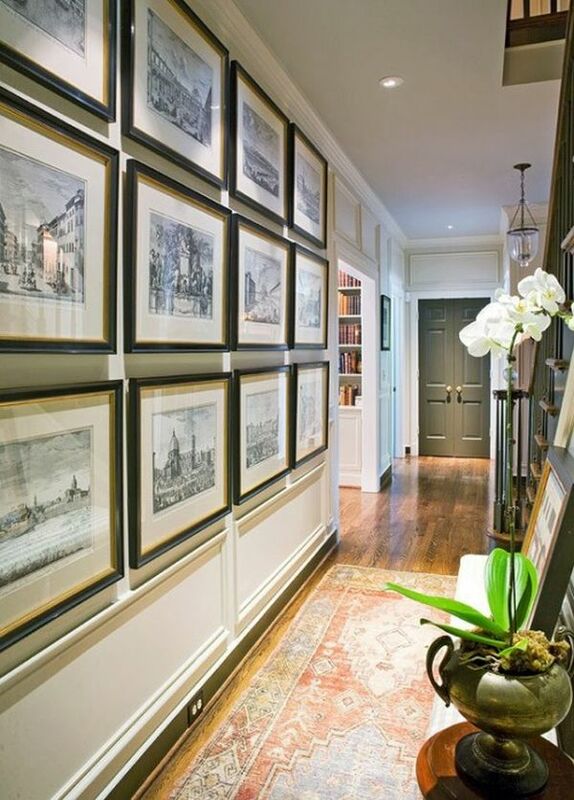 The hallways were 48 inches wide, which made them feel very luxurious and spacious, and left plenty of room for nice moldings, wainscoting, etc. The windows were all over-sized such that most started either one or two feet from the floor: they had mullions are were essentially 12 over 12 or 9 over 9 double hung windows. And the master bedroom had built-in cabinets along two walls, some of which featured closet rods so he could easily reach all of his clothes. We loved them. He also had installed motorized lifting devices in the bedroom and bathroom that tied into the roof joists. It was much nicer than similar systems I’ve seen that rely on frames that rest on the floor, though this was all two decades ago and I’m sure the technology has improved. In the bedroom, the ceilings were very high and also had skylights because he spent a lot of time horizontal. I don’t know anything about roof construction and the pros and cons of trusses, etc., but if gadgetry like might one day be desirable, plan for it now. When you plan the laundry room, think about where the plumbing lines serving your current soon-to-be-demolished master bath run and whether that should inform the placement of your washer, utility sink and dog washing station and, hence, the tear-down strategy. 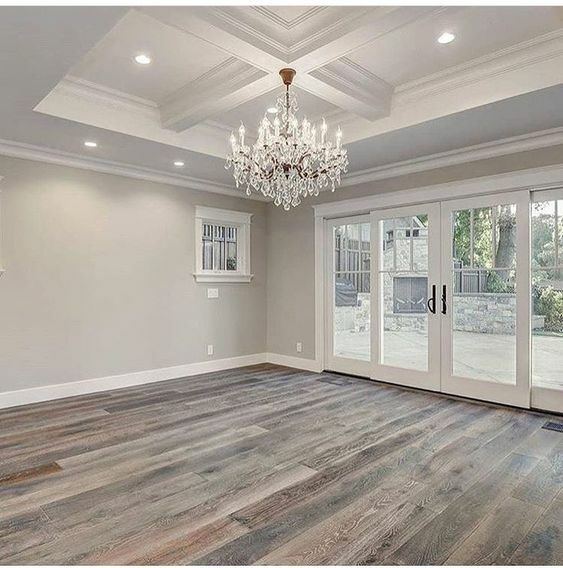 I think putting french doors leading to the deck in the family room would be nice, both because it would make your home’s back elevation more balanced and make it easier for Matt to go outside from that room. The fireplace could go on the wall that extends out from the pantry. I can’t wait to see how your plans evolve! My daughter and wonderful son in law live in TX and he navigates life in his wheelchair. They are adding on to their home right now, and the master bath will all be ADA compliant and the large shower is in the same room with the toilet. Then outside that is the bathtub and the sink. Also, since we are talking north TX, they built in a storm room that is in the bathroom ( it looks just like a room with a metal door) so I wondered if a storm/safe room could be an idea considering where you live. Also, his closets will look very much like what you have in mind which is so clever of you both, and she will have her own walk in closet . Oh, and can I add that the door from the master bedroom to the laundry room doesn’t make sense to me- unless you love it then it will be great. Our community recently raised funds to add a palliative car suite go the local hospital. My mother spent her last days there and I was so impressed with the design of the room, there was a ceiling mounted electric lift that lifted the patient from the bed directly thru the door to the bathroom. No wheelchairs needed. I can’t remember exactly how the rails worked but the adjoining door closed fully. As a matter of fact it was an ingenious door too, now that I think about it. It opened in or out on special hinges. No need to manoeuvre around a door that sticks into the room.I’m sure it would be very expensive but it would be easier on patient and caregiver. Love the ideas. Since the master bath is an extra large room, what about adding a second door to the master bath from your main hallway by Matt’s game room. It seems it would be quicker for him to come out of the game room and head into the master bath thats designed for him, rather than going down the hallway and through the bedroom to get to the master bath. If you decide you don’t really need the pocket door from the master bedroom to the laundry room, maybe you could put in a chute… where you drop in your dirty clothes from your bedroom and take them out in the laundry room when ready to wash. My cousin has that kind of setup and loves it. Love the plans. I’m all for keeping the pocket door from bedroom to laundry room. You know your habits, it’s not a big deal unless you do laundry right at bedtime, otherwise it’s very convenient. In fact, I’d extend the laundry room wall to the bath wall and make it a huge walk in closet with laundry in it. 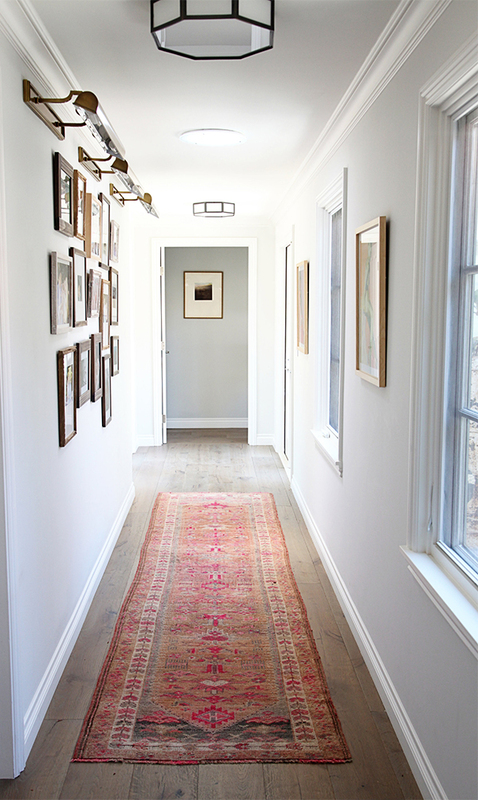 (I just hate giving space to hallways if you don’t have to!) . The entrance to your bedroom could be moved to the bath…kind of a mini foyer, to the right is bedroom, straight and to the left is the bath. I’ve had a bed/bath like this and it worked nicely. I also love the idea of possibly putting the hall on the outer back wall instead of by the bath. I know whatever you do will be amazing!! Seeing that your MBr closets are somewhat limited and your new Master Bath will be so spacious, I would recommend built in drawers and cabinets for underwear, t-shirts, shorts, etc., anything that’s usually folded. It’s super convenient for dressing and leaves the proper closets for the larger hang-up items. My BIL is a parapalegic in a wheelchair. 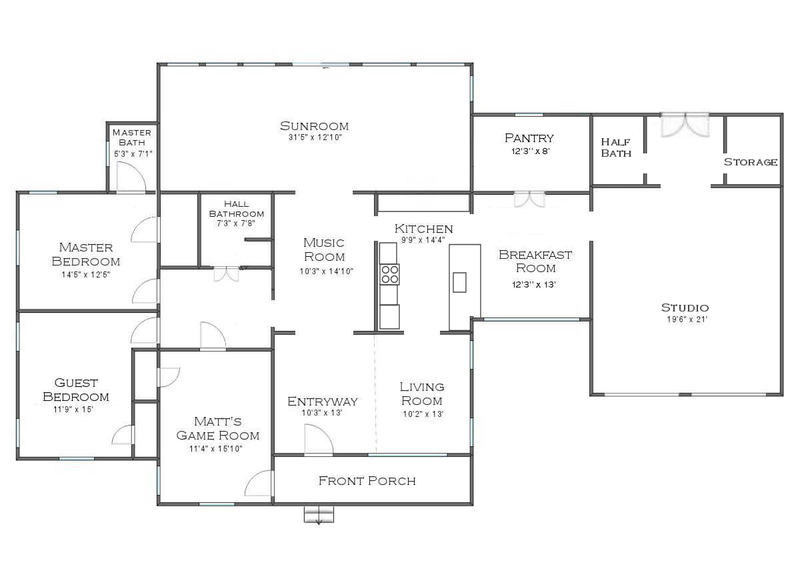 I helped my sister come up with a lot of design plans for their house. Their house is very open to make it easier for her husband to get around in the whole house. Their master bedroom is large, with double doors leading into the bathroom. There is a deep whirlpool tub, toilet and her sink/vanity area in this room. There is a door at one end of the room which is her walk in closet. On the other end of the room is another door, which leads into her husband’s private accessible bathroom. It has wall hung sink/counter top which is at a height easier for him to use. There is a toilet that is higher than normal and a shower that is large enough for him to transfer to a bench inside. His closet is in his private bathroom. His bathroom is not overly large, but it is quite open in the middle giving him plenty of room to maneuver his chair. He likes having a separate, private bathroom for just his use. Because they built their house new and used a current floor plan as the start, this was the best way we found to put in the space they needed. This is all so exciting! I have a suggestion for the bathroom. We were researching building a home over the last several years and one item I really wanted was for the bathroom to be a ‘wet room’. The entire room is waterproofed with a drain in the shower area. It’s 100% handicap accessible that way and can save space since you don’t need a designated shower area. The entire room is the shower area. That could actually double as a dog wash saving space in the laundry room as well and the bathroom could have a door for outside access. I’m a major lover of combining rooms so they are dual purpose. 😉 Everything you do turns out so beautiful that I’m sure however your addition turns out it will be GREAT!!! Could you save money on the plumbing costs if the laundry room and the master bath were back-to-back or adjoining in some way that would involve running less pipe? I can’t wait to see how this part of the house unfolds. Your work and your adventurous spirit are so inspiring! Since a new foundation will be required I suggest you consider making both the laundry room and the master bath “wet rooms”. This would make the shower; totally chair accessible, negate the need for a dog wash, eliminate any washing machine “leak” worries, and allow for “hosing off” the chair should the need arise. As the servant of two HUGE dogs I can assure you that washing a dog in a big shower is infinitely easier than any other method. Just remember to add the blocking for a leash loop. A simple stool you can pull into the shower will save your back whilst shampooing Cooper. He can “shake off” in the shower without spraying water everywhere. 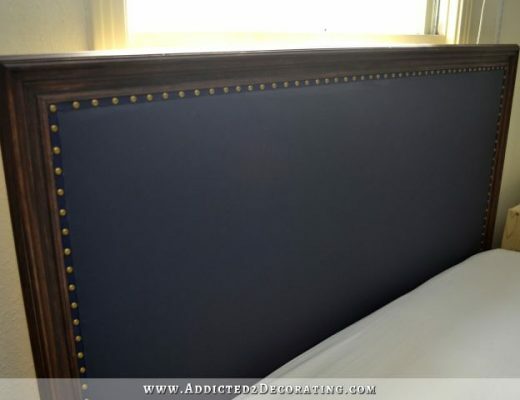 Hello Kristi, I just found some examples for my earlier comments from March 27, 2019 at 4:09 pm with one additional idea for the MASTER BEDROOM. WINDOWS/FRENCH DOORS ALONG BACK OF HOUSE PROVIDE CONVENIENT ACCESS TO THE DOG WASH and NATURAL LIGHT TO ENTER THE LAUNDRY ROOM/DOG WASH, HALLWAY AND FAMILY ROOM. MASTER BEDROOM WALL OF WINDOWS/SLIDING FRENCH DOORS: Changing the placement of closets to an interior wall instead of on either side of a set of french doors would provide unencumbered view and more natural light to enter the room and will give your master bedroom a more spacious feel. CHANGING STANDARD FRENCH DOORS TO SLIDING FRENCH DOORS: May be more appealing as it provides greater width and ease of access for wheelchair and no allowance required for the door swing. The new laundry is right next to the master, I feel like that door going into the laundry is a waste of wall space for both the bedroom and the laundry. if it were me, I’d be okay with taking 10 extra steps to go out and in, instead of having that doorway connecting them. Thats just me.